It’s high-roller heaven in Vegas with its luxurious and over-the-top casinos, but it appears these hotels have opened the floodgates to raise the stakes with their drink game too. 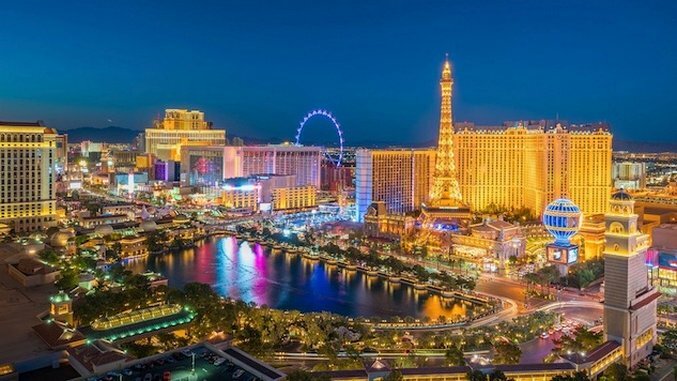 Las Vegas has not only become a culinary wonderland, but one where cocktail connoisseurs, beer barons and wine enthusiasts can come and get delightfully buzzed with inspiration. To add to the element of fun, the coolest drinks on the strip are shrouded in secrecy; Paste is here to give you the scoop on these hidden sips. The setting: Feels as though you’re sitting in the eye of a crystal chandelier; there are plenty of purple tones that include velvet seating and carpeting. You’re surrounded by strands of sparkle, glitter, and bling. Secret drink: Verbena, only available on floor 1.5 of The Cosmopolitan Hotel (between floors 1 and 2, considered the floating bar of The Chandelier). Created by Mariena Mercer, Mixologist. A lemon verbena and ginger infused margarita garnished with a sichuan flower (aka Buzz Button). The drink is finished with tequila (Herradura, their house blend), lemon juice, yuzu sour, and ginger syrup. Initially, it’s a citrusy concoction with delicate ginger fizz. It’s followed by a “second part” to tasting the cocktail; you’re instructed to chew the sichuan flower for at least 20 seconds. As you chew and roll the flower over your tongue before swallowing it, your taste buds begin to pulsate and buzz; your salivary glands are kicked into overdrive. It’s almost the sensation of electric waves rippling on your tongue. There’s a bit of a numbing sensation as well; and when you take another sip, you extract a different flavor profile from the drink— each person can have a different experience. Some find the drink to be smoother and creamier, while others can say it tastes salty, or that the tequila is suddenly more pronounced. Ask for it: By request only, not listed on any menus. The setting: Industrial chic meets German bierhaus with exposed brick and wood panelling; dining style is communal and features picnic tables and roomy banquettes. Secret drink(s): Rarities and Unusuals menu. Six limited-run taps on constant rotation. Curated by Chef Nathan Frost, Executive Chef; he spearheads the Beer Program. On this occasion, the features include Mega Wheat Imperial IPA, Trade Winds Tripel Belgium, J.K. Scrumpy’s cider, and Boneyard Pale Ale. Beers enhance the dining experience and flavor profile of regional American cuisine that’s blended with modernist takes on German classics (e.g. Frito pie, Beerhaus Brat on a Bun with IPA cheddarwurst and smoked bacon, Pretzel and Beer Cheese Dip). Mega Wheat Imperial IPA: Citrus pine and resinous. Medium golden color. On the tongue – notes of citrus, pine and fruit. Dry and bitter finish. Trade Winds Tripel Belgian: Spicy aromas of cinnamon, cloves and nutmeg with the light smell of hops. Deep yellow hue. On the tongue – orange, red fruit, spices with a dry finish. J.K. Scrumpy’s cider: Apple, vanilla and cinnamon scents. Medium gold in color. Sweet cider that tastes like warm apple pie. Boneyard Pale Ale: Floral aroma and an abundance of hops; there is a faint smell of melon too. Pale gold color. Hoppy taste with undertones of citrus and pine; it is bitter finish that doesn’t linger. Ask for it: By request only, not listed anywhere; option to try one or all six via a flight tasting. The setting: An oasis bar situated in the middle of the hotel and surrounded by slot machines. Features leather seating, forest green carpeting, with a grand piano situated in the corner. The environment creates a lounge vibe and includes late night live jazz performances from local talents. The purposeful design contrasts that of the tropical aesthetic the casino and hotel have. Secret drink: Cocktail 23 (named so because the owner loves Michael Jordan), but the name also works because it sounds like a mysterious “Love Potion Number 9” and is on same moody wavelength they’re trying to create with the drink. Created by Gary Schneck, Bartender and Lead Mixologist. Cabanze a Blanco tequila, tangerine syrup, house-made jalapeno syrup, guava puree, lemon juice, lime with spiced lavender mist…All at once, it offers tropical fruitiness with a slight bitter edge, along with notes of spices and a fiery heat at the back of the throat. Ask for it: By word of mouth only, request drink from the bartender. The setting: 1920s aesthetic complete with amber-colored lighting and plush velvet seating; the room is filled with ornate trinkets (lamps, postcards), while vintage photos of follies line the walls and wooden doors (salvaged from a torn down hookah lounge nearby) line the ceiling. The feel is that of a seductive and secluded speakeasy of a bygone era. Secret drink(s): Cocktail menu provided in a keepsake booklet which Daniel Marohnic crafts each year. Encourages guests to be guided by their cravings or spirit preference. Created by Daniel Marohnic, Corporate Mixologist for Corner Bar Management. Favorites include the Whisker Rub (bourbon, cacao, honey, cream, nutmeg) which tastes like liquid dessert akin to a spice cake, or Triple Lindy (apple brandy, smoked maple, orange bitters and brandied cherry) which offers headiness and almond notes, and Bit-A-Ginger (tequila, grapefruit, fresh lime, ginger beer, mint sprig) which offers vibrant citrus notes and a welcoming herbaceousness. Ask for it: Must text detailed reservation request to 702-701-1466. Email, in-person and phone requests are not honored. The setting: Old-world charm; it’s like stepping into an authentic wine country cellar in Napa Valley. It is a welcoming contrast from the high-energy, multi-colored space of the Rio Casino. The tone in the wine cellar is sophisticated and relaxing. Features include rock and brick archways, lofted ceilings, and warm wood-fire tones. Secret drink(s): A flight of rare/hard-to-find red or white wines. Curated by: Sommelier and Head Manager Hung Nguyen. Opt for the “Choose your own grapes” – an opportunity to select six different wines from the extensive portfolio (100+ different types of wines by the glass). Wines can be paired with artisan charcuterie and curated cheese menus. The taste ranges from robust and funky reds such as Caymus Cabernet Sauvignon 2014 (woody notes, spice and fruit on the nose, long finish), to full bodied and juicy whites such as Markus Molitor Zeltinger Schlossberg Riesling Auslese 2014 (concentrated, mineral and smoky aroma, lemons, peaches and apricots), and everything in-between. Bonus: See rare museum pieces like a bottle of 1800 Madeira from the cellar of President Thomas Jefferson (not for sale), the 2 bottles left of Domaine de la Romanee-Conti Echezeaux 1985 (6L, and price tag of $95,000 per bottle) in Las Vegas and the only bottles (12 are left) of Massandra Muskatel Crimea Ukraine (from 1900) in the country (with a price tag of $2,500 per bottle). Ask for it: You must first find the wine cellar in order to ask for the list of rotating wines and their respective availability. It is in a secluded part of the casino (the “Masquerade Village”) and not advertised anywhere. Blink and you can miss the winding staircase that takes you down to the cellar.